The other day I met two of my workmates on their way to lunch. I asked them where they were off to. “Have you ever tried the Indian there?” I asked. “Yes but I’ll never go back there.” One of them told me. “Why not? Is the food that bad?”I asked. “No… the food’s okay but the lady there – she is so miserly, she doesn’t make you feel welcome.” He replied. I knew what they were talking about. I’ve eaten in the Indian eatery once but have heard the same comments from other colleagues. The lady is stingy on portions and barely smiles, almost snickers when serving. There are hardly any lunch queues when I walk by. The sandwich eatery on the other hand, is always packed. The coffee isn’t particularly good, and the sandwiches are by no means gourmet, they are standard sandwiches which you would expect to get from most places. But the servings are huge, in fact, even the most voracious of eaters can only finish half a sandwich! The owner and his wife greet you by name every morning as they start to prepare your coffee even before you ask for a cappuccino with one sugar. They seem genuinely happy to see you and serve you their food. It’s no wonder people keep coming back. I guess, when we cook with love, it shows. There have been numerous times in the past that I have prepared an elaborate dinner with five different processes for each dish and numerous fancy ingredients. But I’ve been stressed out and miserable. And, despite the finished product looking pretty enough to picture, each experience has been disappointing to myself and those in my company. And then the most simple of meals, lovingly prepared have turned out to be amazing triumphs. I’m thinking my Mum’s chicken adobo, my sister’s pasta with tomato sauce, or my other sister’s Greek style roast chicken or maybe… even this Spicy Scallop with Thai Dressing. This dish is from Chef Nobuyuki Ura of Sushi E. It is a very simple dish to prepare – the hardest part is to find fresh scallops to use. Sushi E has been one of my favourite Japanese restaurants in Sydney ever since my husband introduced this place to me over two years ago. My husband eats here maybe once a fortnight and once in awhile, when I get time for a long lunch, I join him. This dish is one of the regular dishes we order. Blow torch the scallops in a heat proof plate. In your serving plate, lay the salad sprouts and then top with the scallops. Wow, these look fantastic! We’re in the process of making them now, and were just wondering about the ingredient quantities – 150 g of vegetable oil seems a lot! We reduced it down to 50g, but was that really the correct amount? Wow Trissa for a moment there I thought you took shots of these at restaurant. Beautiful. Mhhhh. Salivating just by reading your recipe – exactly my kind of favourite dishes!! Being more of a fish & seafood person myself, I’m a big fan of sushi-e. They have some of the best sushi in Sydney and the fish is always so fresh, so tasty. I’ll have to try this recipe real soon, I’ll let you know how I go! These scallops look divine, Trissa! And you are certainly right that food made with love is clearly distinguishable. And those with good taste prefer the food with heart. You are so right in that it matters a great deal how the people in the restaurant are! I’ve had situations where the food was good but such a miserable service that I wouldn’t go back even if they paid me! So totally with you on that one! And this lovely scallop dish is just beautiful. I love fresh scallops but they are a little hard to find here unfortunately. They have them in vacuum packages.. Yukk….! I heart scallops, and these specimens look fabulous. Oh wow this looks so amazing!!! I’ll have to wait till scallops go on sale though. Great shots and presentation. Oh wow, I am stunned by your beautiful photos! I am glad I found your blog. Scallops are one of my favorite seafood! Looks yummy! I love my scallops nice and simple or beautifully flavoured – this recipe ticks all of the above!!!!!!!!! Oh Trissa, you’ve done it again!! Pictures are gorgeous! Your scallops look so plump and succulent, delicious! Do I put the spicy mayo before blow torching it? Then the Thai dressing, right? Looks good n can be made with our Montserrat fish, isn t it. Somehow blow torching it makes it appetizing. Will try it soon. Wow, your pics are really wonderful. The scallops are so tempting, can’t help drooling! 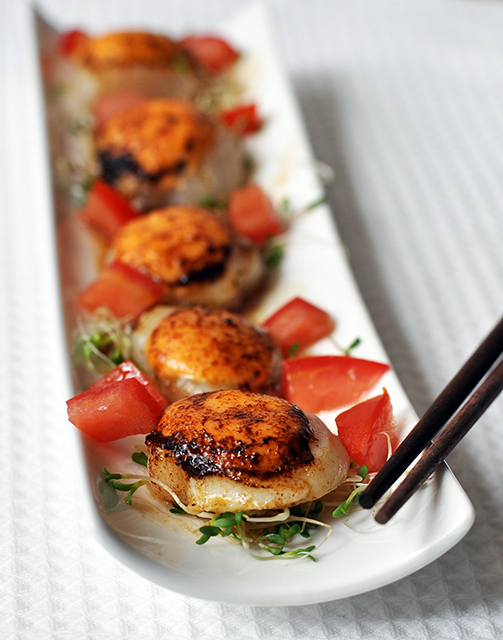 Love the scallops lightly blowtorched (always have it @ the sushi shops!). Looks amazing. Trissa, this is definately one of your best recipies. It looks really professional and I am sure tastes great. Next time I see really fresh scallops I will give it a try. I love scallops, I love sprouts, I love all things seared, I love this dish! Another awesome dish. Gosh, you really know how to present food beautifully, and your photos are always stunning. I love coming here. Food equals love and it always come through when something is lovingly prepared and served. 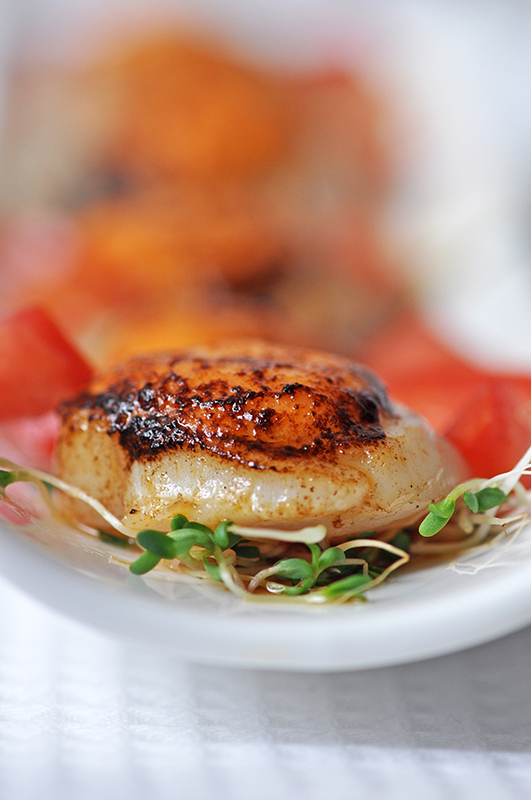 Your scallops equal love…yours and mine! Thanks for the new recipe to try. I am always looking for new ones for scallops and the Thai dressing seals the deal. With Thai dressing…..I’m definitely in love with it. Looks very delicious. I have never cooked scallop yet. Got to try one of these days. I have eaten a scallop dish at a restaurant here. It was served as a starter with brandy sauce….absolutely fabulous! Now talking about customer service, I’m always annoyed at shops that make me feel as if we owe them, even though we pay for their service! Speaking of love, I have fallen deeply into it with these scallops. I want to whisk them off to a magical place. I couldn’t agree more about cooking with love. Like Water for Chocolate is real! Real I say! OMG…YUM. Those look so amazing! I have a goal for the weekend: get fresh scallops! This dish looks delicious and I so much love Thai food. And I’m pretty sure this was prepared with love! 😉 You are right about it. It always shows. Great looking dish! Haven’t been to Sushi-E but it’s a must try list after reading your post. Oh Trissa! Here in New England, we can get beautiful Northern Atlantic sea scallops… I cannot wait to make this dish! So fresh and simple, but oh, the flavors! Blow-torching, though? Do you think I could pan sear them on one side and then broil them on top so the spicy mayonaisse bubbles? fantastic photos as always trissa! and i agree cooking with love is the best ingredient ever. Stunning…..as always. I wish I loved scallops…..And I agree, when you do things from the heart – it shows and you have ‘the’ feeling! 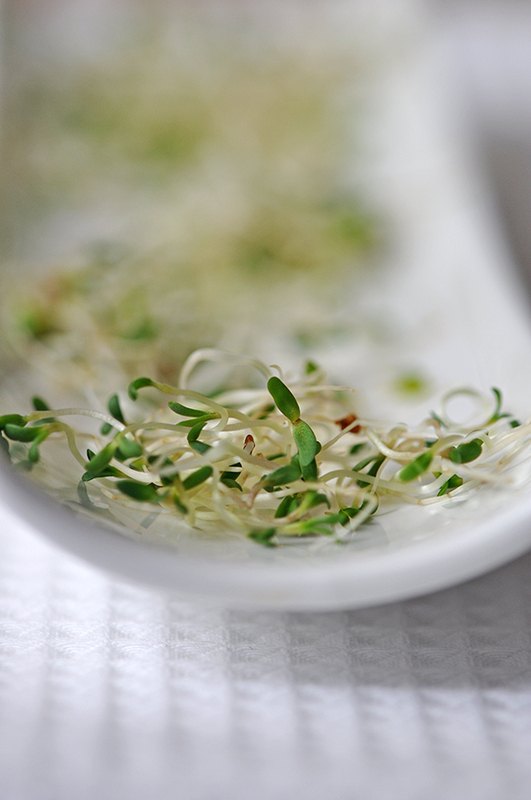 I love that shot of the alfalfa sprouts. You’ve got a real eye for photos. Woah….your scallop dish must have tasted heavenly! Ah! It’s gorgeous… I love scallops but it’s always so tough to find fresh ones.. Love the sear on yours..
It’s true, when you cook with love it really shows. I like to believe that when we are happy and passionate about what we are making the flavors really sing and everyone enjoys…but when we are stressed out and cooking out of “obligation” it likewise reflects in the food, no matter what expensive ingredients or fancy cooking techniques we use. When my dish is raved, guests would ask me “do you have a secret ingredient malou, because I don’t cook it the way you do?” and my quick answer to that is: “yes in fact I do” and they would ask again “Pa-share (please share)” and I would say ” love… tons and tons of LOVE!” And they would all discount it as corny or cheesy baduy but it’s true. In fact my husband could tell from the dish that I cook whether I’m in a good mood or not… That’s why when I’m in the kitchen, he keeps on hugging me hihihi! I could tell Trissa that this scallops are lovingly prepared… the seared crust were lovingly watched… the plating was lovingly touched… Your family is blessed to have you! I share the same thoughts as you and was just speaking of kindness yesterday. We have a food court.. about 25 mins away in a mall..My daughter loves the Asian one..and always orders the noodle soup..:) She has been pregnant it seems for 6 yrs w/ her 3 boys:) and the same lady always greets her..This is a mall of thousands of people a day! The last time my daughter was expecting Poodle(Olivier)..who is now 6 months.. she said..another for you? How nice..And meant it! I wish waiting rooms in doctors hospital had greeters.. someone to calm and care .. I wish every one turned their frowns upside down..or rightside up. This is a cute post 🙂 Pretty too of course. oh trissa this is such a tease! i love scallops and love thai cuisine. this is looking awesome right about now. i’ll being the macarons if you cook me some of these. deal? Is this the one which you were telling me that day and Nick….. LOOKS so GOOOOD! wish i stayed longer to try it out. Having found an appreciation for scallops in my later years I would def devour this dish. It’s true what you said. When you cook with love it always shows. And some people will ALWAYS be miserable. Trissa, this dish is cooked with soooo much love, it shows!!! LOL. Blowtorched? That means you have one da house? I’m jealous. 😉 Very posh looking dish! Wow how come I missed out on this!? Ben will definitely be asking for a repeat of this! Or if ur too lazy I’m sure he won’t mind going to sushi-e with his ninang! Sinful and yet seems healthy! Cheers. Oh yum scallops. Trissa your photos are so enticing. I believe that food cooked with passion and love is the most delicious. It doesn’t matter how simple. Yum Trissa this looks fantastic! 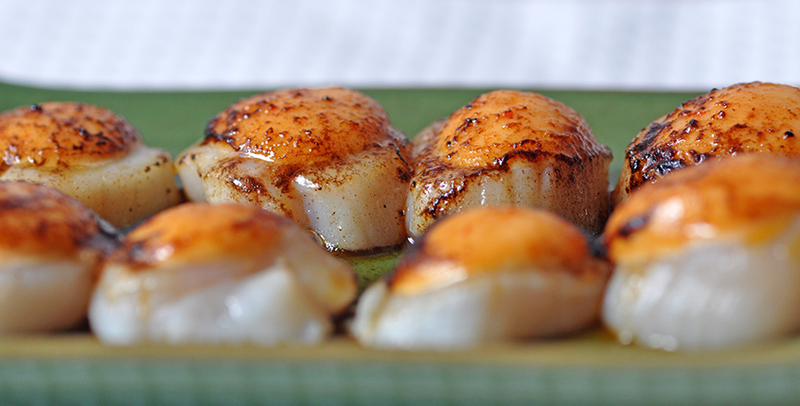 I could literally lick the screen right now… Where did you get your fresh scallops from?